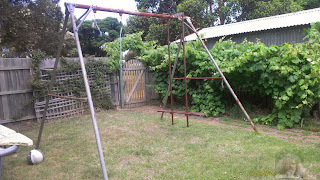 As kids we played a bit on my school friends swing set until we were of course too old. There is a bend in the cross bar from an old cedar branch falling down on it. The Lawlers went on an around Australia Trek on 1974[? 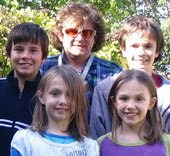 ], in a Land Cruiser with a pop-up caravan- June, Alan and the four kids, Sean Martin, Libby and Patrick. They ended up working out of Darwin, after Cyclone Tracey. 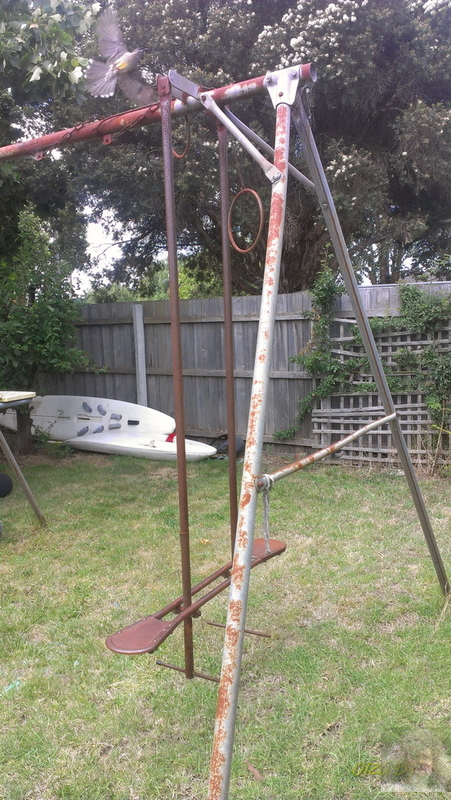 We ended up with an extra swing set for the Mornington backyard! The swing seat and chain rusted away to be replaced by a tyre and rope swing- the rope is gone the tyre is awaiting a rebirth- it hopes... I have often sent pics of my kids away to the Lawlers- I do not think they remember the swing set. Plans for the steel- recycling as a trailer attachment to carry surf and windsurfing gear [in the back ground]. My twin gels have been fitted out with some new gear, care of their grandmother and their aunty. Christmas Time gifts, just in time apparently. Now they can fit in with the rest of their classmates, and not be embarrassed in the change rooms. They were pretty excited according to Aunty, and she said she was proud to be with and help out her sisters' kids at such an important milestone in their lives. Oh I remember that swing set vividly. The death defying gymnastic maneuvers I did on that thing.... make me shiver in fear.